When I was a child, having a set of encyclopaedias in the home was quite a status symbol. Responsible parents turned themselves inside out to provide their kids with a set, to ensure that they had the best possible homework assistance at their fingertips. The disadvantaged kids had to queue up at the library for their information. We lucky owners were ranked according to whether we owned a set of Groliers (like ours), World Book, Funk & Wagnel, or the ultimate - Britannica. I can still remember the powerful emotions I felt whenever I handled a volume - as though all the mysteries of the world were there in my hands to be siphoned up and absorbed. Now we have the internet. Something we never could have imagined in those days. And it's vast - with so many bells and whistles - and always up-to-date. And now, even as a wrinkly senior, I feel the same thrill about the internet as I did with those encyclopaedias long ago. Our children grew up with Funk & Wagnel. I remember the pangs when they had all moved on and I realized it was time to discard the dusty row of books from the top shelf. Now I'm eyeing off a few other old faithfuls that have also had their day. It's good to start scaling down on possessions - thinking ahead to the time when we will eventually have to pack up and move into more compact, aged accommodation. 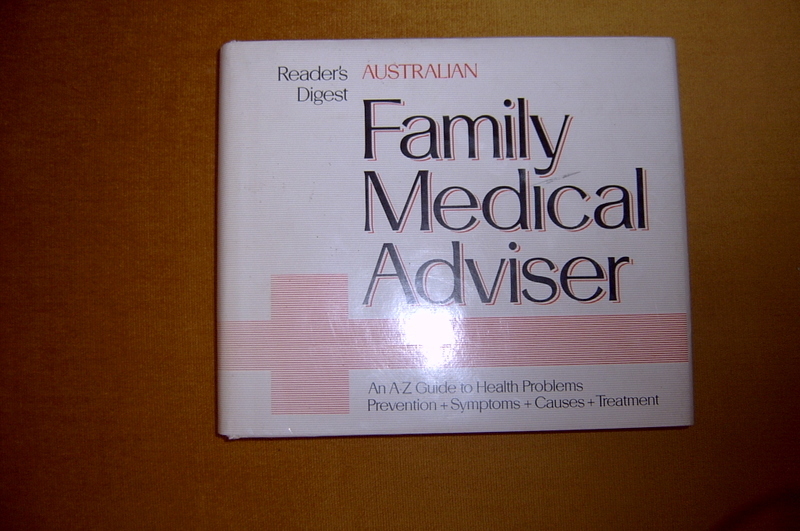 I know I haven't opened my Reader's Digest Medical Adviser for a year or two. Published in '84, it is now very definitely 'old hat'. All my health related queries are answered so much better on-line. I can see that other books like atlases, dictionaries, telephone directories, cook-books and various manuals will soon go the same way. That's progress ... and it goes down well with me. Like I said, they always turn up in twos. 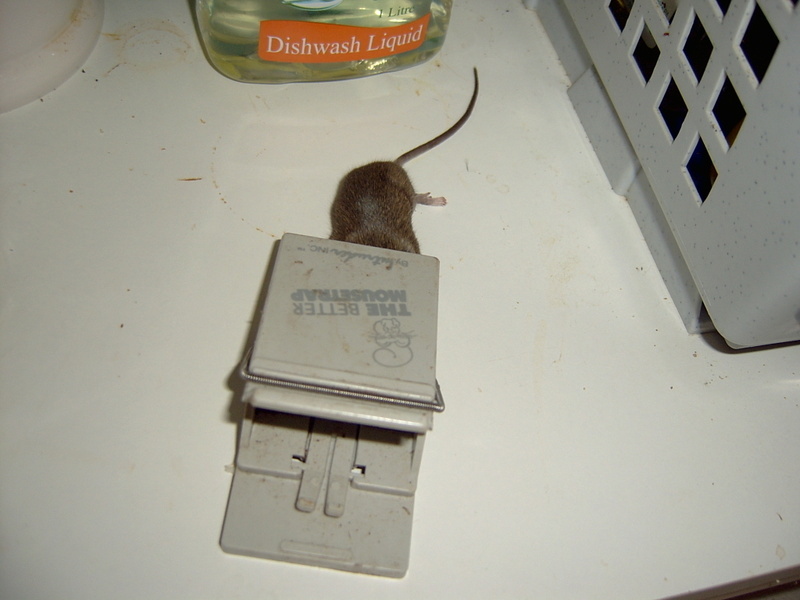 Caught another mouse under the sink today. I've reset the trap; may as well go for the trifecta. I'm glad my Buddhist friend doesn't read this blog. She catches all her mice live ... and then goes to great trouble, driving miles out of town to release them into the bush. At least she's more responsible than another Buddhist lady I heard about. She used to drop off her mice in the local school-yard, saying that she knew there would always be plenty of food scraps for them there! After viewing this shot (and disposing of the mouse), I went back to the cupboard to give it a scrub. Just letting Tabor know that not all of my house is as clean as she might expect. In thirty years of marriage, we two have always claimed our own, same side of the bed; his is the right and mine the left. It has always been that way - throughout the 10 house moves and countless nights in strange beds when on holiday, or on the road. Alternately we have been winners and losers; in some motels I get the light switch and TV controls, in others I am crammed beside the wall. In our current house I have a distinct advantage. I am right opposite the bathroom door, so I am not the one who has to face the bumping and stumbling over furniture and stray shoes when I have to get up at night. As well, my side of the bed is directly beneath the ceiling fan, and furthermore, I am positioned at an intersection between the window and two doorways, right in the pathway of the slightest cooling breeze. On several warmish nights this summer, when we have engaged in the endless battle over whether or not the air-conditioner should be on, I have gallantly offered to swap sides. Would he be in it? Of course not! He isn't even prepared to accept my obligation free, one night only, special trial offer. Men are creatures of habit. This one is determined that he will be getting out of the right side of the bed - forever. I wonder whether it's the same with all couples. Or are some happily ambidextrous - as I think I am - if ever I get the chance to find out. A mouse somehow found his way into the cupboard under the sink. If there are any creatures I am truly afraid of they are mice - and even more so, rats. Spiders and reptiles I can handle OK, but there's something really creepy about rodents, so this one had to go. The huntsman of the house set two traps - one in the cupboard where I saw him, and, without even thinking, we put one beside the dishwasher. We've found over the years that there's rarely just one mouse; they usually turn up in twos or threes. The first night there was a mouse in the trap under the sink. The second night we caught my pet kitchen skink. Very sad! He had become so tame these past few weeks, appearing on the kitchen floor, right there beside me, at all times of the day. I had even been contemplating putting out tiny food and water dishes for him. There are family members in residence in the living room and the spare bedroom, but I'll miss my kitchen companion. My headache was back again this morning. Not surprised; my 'migraines' are always two day affairs. At least I can usually count on coming good on day three. And I am thankful that Easter will be mostly spent quietly at home. In the meantime there's the dilemma of whether or not to bother taking pain-killers ... and what I can eat without making it worse. As I said yesterday, the list of suspect foods is very long. I made some toast this morning, but what to put on it? Marmalade is citrus, and Vegemite is yeast. Yhogurt is a no-no and so is coffee and orange juice. Lunch is a boring affair when you have to exclude tomato, avocado, cheese, onion, processed meats, dressings and pickles. I only threw a sideways glance at the fresh sourdough loaf and the hot cross buns. But then also, practically every kind of fruit is out - especially the ones that I most enjoy, like pawpaw, bananas, and pineapple. I took a walk in the garden munching on an apple. The Pride of Barbados is in bloom. And the lovely Singapore Frangipani. Then I had my daily swim. The water temperature was perfect. This is the pool, taken when the Purple Wreath was in bloom. Relaxation and deep breathing always help with pain. Earlier today I managed to sit briefly for some meditation -- and so made a start on a new commitment with the group that meets together at a site called 100 days. They're an interesting and eclectic group of (mostly) bloggers and I'm looking forward to spending the next three months meditating with them. I awoke with a headache this Good Friday morning. I wasn't surprised. Yesterday had been somewhat stressful - a rare occurrence for me. A lot has been happening of late. As I reported last month, two of our kids have been house-hunting. Now both have just signed up for their new homes - within two weeks of one-another. Only son's purchase was relatively smooth. He and M took a little time to work out what they wanted, but within the limitations they had set themselves, their choice had not been difficult. Friends and family, including M's parents and ourselves, were asked for their opinion and advice, and finally the purchase went through. For daughter #2, vey pregnant and not yet relocated from Melbourne, the story has been a little different. For the past four months she and B have been house-hunting by internet, with a willing mother and a not so enthusiastic father, sallying forth to Brisbane each weekend to check out possibilities on the ground. Armed with a camera, clip-board and pen, we reckon we have trudged through 50 homes - and driven by 20 or so more. But we were glad to be of use, and tried hard to be thorough - despite the fact that the parameters seemed to be changing from week to week. Time was running out and the right place still hadn't turned up. Then this week, one more possibility presented itself. This time little brother was pressed into service to attend a mid-week night-time viewing. He had his phone at the ready to give an on-the-spot description and took the usual digital shots to forward by e-mail. Two days later it was all over! We were advised that this was the one - an offer had been made and had been accepted. This poor Mother went into a tail-spin - probably from anti-climax. A place they hadn't actually seen - and one that had not even been given a parents' seal of approval. How could they be sure they were getting the right house? What unimaginable defects might little brother have missed? Very little sleep for me that night - and now today, a headache. Although I don't often succumb to stress, I do have regular headaches. Usually I can pinpoint the cause, and will mostly identify something that I ate as the main culprit. On this occasion it could have been caused by any one of a number of known 'trigger' foods. Although I have all but given up coffee in an attempt to curtail my migraine heads, I have been taking a lot of weak tea, and yesterday I did indulge in a little pre-Easter chocolate. And then there was the glass of wine at dinner - and the avocado and the cheese at lunch - and the yhogurt for breakfast - and the fruit-cake with morning tea and an afternoon snack of a banana and some nuts. All things I should be avoiding as a preventive measure! I guess this puts me on the same footing as Tjilpi who admitted to having a hangover last week. But I am wearing something slightly more decorous than a pair of underpants on my head - a cooling headband of water crystals in fact. And let me tell you - it's going to be a chocolate-free Easter for me this year! A week has sped by, during which time my hearing has improved vastly, although my ears continue to pop and click whenever I yawn or swallow. I've been missing from the blog, busy devoting considerable time to family and various matters that needed my attention. There have been two days at my casual job, the grandchildren came for another hectic morning, builders have been to tend to small renovation jobs, I travelled to the city for a symphony concert and again to see the Queensland Theatre Company's production of 'A Streetcar Named Desire', then twice more to househunt for my pregnant daughter. I gardened and made mulch - and then spent two more days out in the glorious autumn weather playing croquet - my wonderfully relaxing, but also grippingly absorbing, sport of choice. In between, I've been swimming each afternoon in the pool - warmed by a recently installed solar heater - and cooking up banana muffins and cakes to use up the last of the over-ripe bunch we picked. And in whatever time I can find, reading "The Meeting of the Waters", an intriguing account of the infamous South Australian Hindmarsh Bridge affair and its entanglement with the secret Aboriginal women's business. The book is written by journalist Margaret Simons - a favourite writer of mine since the days of her 'Earth Mother' gardening column in The Australian - and even more so after her delightful book about compost, "Resurrection in a Bucket". But back to the kitchen and the garden - both the dragonfruit have been picked and eaten. And you are right Mikhela - lime juice helps a lot. Otherwise, some big scoops of natural yhogurt. I'm developing quite a taste for the red dragonfruit, and will be keeping an eye on the new crop coming on. Meanwhile the Tamarillos (aka Tree Tomatoes) have ripened. These are another lesser known subtropical fruit. 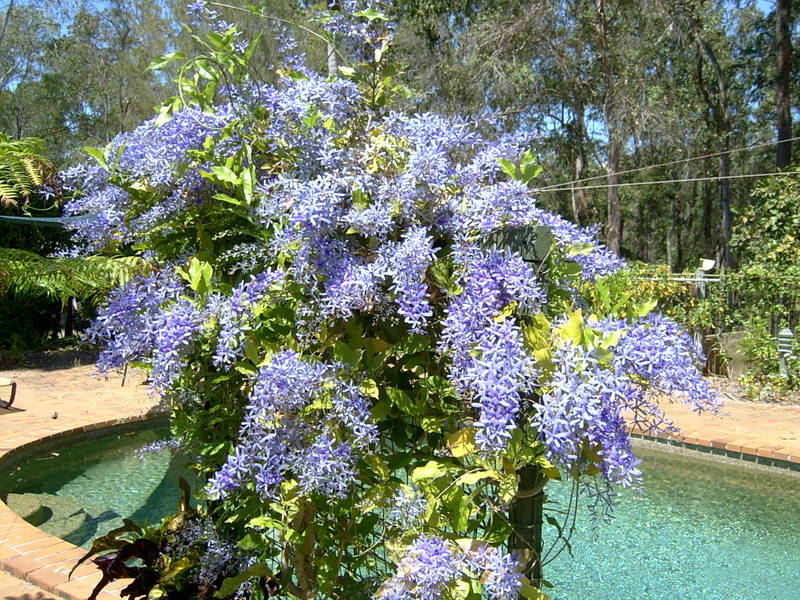 Originating in South America, they are now widely grown in New Zealand for export. Again, they don't have such a wonderful flavour, but are juicy and refreshing and very versatile for those who like making jams, chutnies and sauces. I like them because the tree is quite attractive as well as fast growing and early bearing. You can see the fruit here against a backdrop of banana leaves. Here's the tamarillo tree soon after we planted it, a little over 12 months ago. The leaves are big and shiny and the size of dinner-plates. Behind it you can see the cactus of the dragonfruit plant snaking up and across the wire trellis erected for it. That is bearing now too - while next to it, the banana suckers we planted at about the same time, are now more than 20 feet high. The other tree that is fruiting for the first time this year is our Lemonade tree. A lemonade fruit is a citrus hybrid that looks like a lemon but has a mild sweet flavour that makes its flesh as ready-to-eat as an orange or mandarine. We liked our first taste of this fruit so much that we planted a second tree, but this one is growing as an espalier on a wire frame constructed in the same way as for the dragonfruit. The milk bottle hanging among the leaves contains the wild may oil that we put out to attract and drown the fruit fly. It does a good job, as is evidenced by all the bodies floating in the liquid. Below are some of our bright chilli bushes - we have red, gold, green and purple varieties - which amazingly, are regularly raided by birds. It's probably time for me to make some chilli jam again - and some lime marmalade - and the rosellas will be ready to pick soon as well. So if you don't hear from me for a while ... ! I already wished my long-time friend Susy a happy birthday this morning, but a little bird told me that it's also someone else's birthday today. So I'm sending special greetings across the blogosphere to Ronni Bennett, who, in a few hours time when she wakes up at her home in New York, will also be celebrating her birthday. HAVE A WONDERFUL DAY, RONNI ! And I wish you a wonderful year ahead, as you move interstate and begin on yet another of life's adventures. The bunch of ladyfingers began to ripen last week, and as usual, we cut it down and hung it on the verandah to pick the bananas as we needed them. As always happens, they all ripened within the first three days. There are only so many bananas that two people can eat. We passed some on to our neighbours and to anyone who called at the house. The over-ripe ones will be recycled in the worm farm. Compost worms just LOVE banana skins. This week we also got to pick our first red dragon fruit (pitaya). I ate it just like this, halved and with a spoon. It was perfectly ripe - soft and faintly sweet, rather like a melon. I must say that the appearance is more luscious than the taste. The brilliant colour and the tiny black seeds create a mouth-watering expectaion of a combination between a strawberry and kiwifruit flavour. The shops price them accordingly - at around $5 each! Now that we know that they are relatively easy to grow, we will take more cuttings and send the cacti plants up some of the trees and fences about the garden. The citrus fruit is all suddenly beginning to ripen too. Here is a selection picked one day this week. It includes our first citron (aka Buddha's hand), a tangelo, a lemon, a lemonade, some kumquats, and three kinds of lime (Kaffir, West Indian and Tahitian). With them is the pink dragonfruit, a pomegranate, a pineapple, some bananas and some tamarillos (tree tomatoes). Naturally the fruit-fly have descended upon our orchard, but we are having some success controlling them organically by trapping them in bottles of Wild May oil hung in the trees. A good way of recycling plastic milk bottles. I would have thought that suddenly becoming rather deaf would be blissful for at least some of the time. A chance to switch off, to opt out of conversations or the taking of phone calls. Not so. My current deafness is accompanied by lound ringing in one ear (if that is Tinnitus, I feel for you Buck) and a noise like crashing waves in the other. But life goes on. And this hard-of-hearing grandma had to concentrate well at the weekend when two very active offspring came to visit. Miss Two talks rather a lot, but not all of it is understandable. Her older brother doesn't say as much, but he does require immediate and intelligent answers to his questions. So it was a busy couple of days. and there were no less than four kids' birthday parties being held at the same time. There was much excitement when Master Six discovered a BABY SNAKE in his bedroom. All of three inches long. We caught it in a glass and on closer examination found two sets of tiny legs. Lizards aren't nearly as scary as snakes. We let him go outside without being sure of exactly what he was. Identification will have to come later, when I have the time. ... and modelled things out of play-doh. Then finally it was Sunday afternoon and time for the kids to return home. Utter bliss at our place. Even with the crashing waves!